Last week was rough, but my bout of the seven day plague has finally lifted! 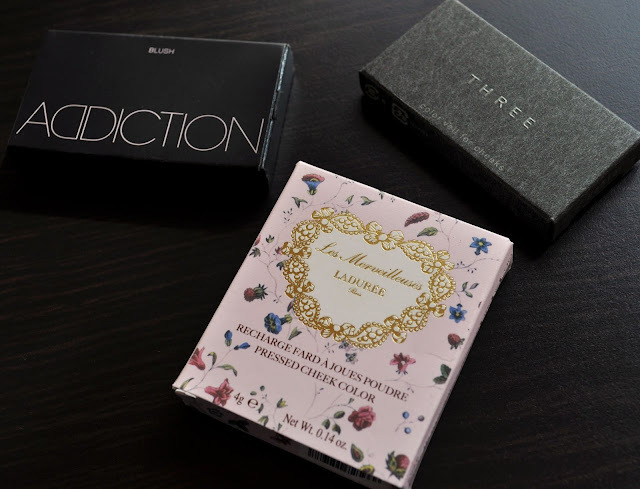 Here's a reminder of my blush giveaway. I'm really excited for this giveaway, and I'm look forward to your entries! I'm looking forward to the New Jill Stuart blush (14)! Thanks for joining and leaving your selection on the comments. I love a nice blusher! My colour preferences change with the seasons though. Currently (winter, rainy grey weather) I love the Dior blush in Soie Precieuse (long discontinued, I think), Nars Douceur and the Essence Silky Touch Blush in Kissable and Summer Dreaming (They are being discontinued, I bought them for 95ct each and they are lovely!). I am not really planning on getting products from upcoming collections, but raher getting some things that I have wanted for a year or so - and still want (a good way to find out if I REALLY want a product is to simply wait a few months and see if I STILL want it:-) ...and I do have too many blushers...). I will buy Nars Gaiety finally and am tempted by the Too Faced Love Flush Blush Wardrobe (looks perfect for travelling). I would love to try THREE - 05 Feeling the Flow, Addiction Blush Mix - Jet Setter, Laduree Cream Cheek Base - 06, Chicca Flush Blush Powder - 05 and Suqqu - 03 Yawakohaku. A good blusher for .95 cents!! Let me at 'em! I like the way you think in regards to your beauty purchases. Wish I had such restraint. Oh hey, lookie, a giveaway!!!! How'd I miss this? O.O Very generous and also one of my favourite categories of makeup, second only to mascara! I too have an affinity for mascara. Love many of you favorite blushes. Also, great choices for the giveaway! Crossing my fingers for you.